Writing in 2010, years after his tenure at NIDA had ended, Dr Leshner revealed that his depiction and promotion of the model owed much to its public relations utility. He had appreciated its “powerful potential to change the way the public sees addiction”, and sought a resonant metaphor to realise that potential. The solution was to liken changes in brain structure and functioning caused by repeated drug use to a ‘switch’, transforming what was voluntary into compulsively involuntary drugtaking – a metaphor which he admitted was chosen without too much regard to the reality of neural functioning. For him, “Perhaps the most important consequence of conceptualizing addiction as a brain disease was that it explained why one cannot just quit by force of will alone – why treatment is essential.” It was an explanation of a non-fact – most dependent substance users do remit without treatment – but one which might be good for treatment budgets, and he hoped, for the prospective patients. From the reams written on the roots of addiction, here the focus is on critiques of Leshner’s “chronic, relapsing disease of the brain” model. The other side of the argument – the case for the model – remains well publicised on the web site of the US National Institute on Drug Abuse, while this book offers a comprehensive account of different understandings of the etiology of drug use. Though US research cash has been the fuel, it has been argued that the brain-disease understanding of addiction “would have never taken hold had it not converged with recovery discourse and become effective at organizing meanings in the popular realm”. In other words, it fit with the recovery agenda, and to the public and their information sources, ‘made sense’ of otherwise contradictory phenomena – like how someone could keep doing something they know is harmful and which they insist they want to stop doing. Driven partly by its propaganda value, the model’s prominence within US ‘drug abuse’ circles has been projected internationally by the dominance of US research and perspectives on drug use. Endowing Leshner’s ‘switch’ with evil intent, later NIDA moved on to the ‘highjack’ metaphor adopted from a 1997 US television special on addiction. In 2008 the UK Academy of Medical Sciences followed suit, depicting drugs of abuse as having the power to “‘highjack’ certain brain processes, leading to dependency and addiction in some people”. 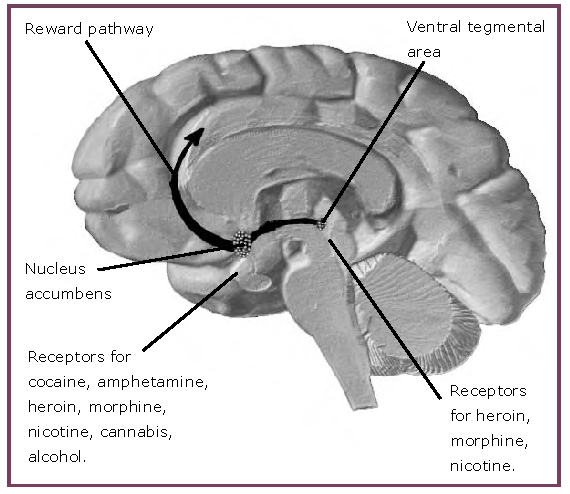 For these authorities, discovery of a neural reward pathway ( illustration) common to substance and non-substance addictions promised to unify the addictions field, paving the way to correcting “aberrant learning patterns” in the brain generated by regular drug use. Four years earlier the World Health Organization had published its report, Neuroscience of psychoactive substance use and dependence, proclaiming that “with recent advances in neuroscience, it is clear that dependence is as much a disorder of the brain as any other neurological or psychiatric illness”. A major feature of the report was its appeal to genetic variations to explain why some people’s brains develop these disorders more readily than others. In these formulations a deviation from normality in behaviour is dramatised as a corresponding deviation from normality in the brain. The treatment task becomes to use the links between these realms to normalise both, generating the productive citizens envisaged by modern understandings of ‘recovery’. According to (free source at time of writing) a historian of drug use and its treatment, these relationships exemplify a broader pattern: “[E]arly twentieth century ‘neurophysiology’ has long been subsumed to the project of achieving good self-governance: personal responsibility, impulse control and appropriate consumption of the ‘right’ drugs”. Since at least the same era, addiction treatment itself has been about restoring citizens to a normal and productive life, not just overcoming dependence – evident when in 1933 US President Roosevelt proclaimed, “In this institution the victims of the opium habit will be restored to usefulness”, and in 1926 when in England the Rolleston committee legitimated the supply of opiates to patients who could lead a “fairly normal and useful life” with the drugs, but not without them. This at first unlikely alliance between the brain-disease model and re-normalisation formulated as ‘recovery’ lies at the core of the “addiction science” understandings offered to their public by the US National Institute on Drug Abuse: It’s like responding to a TV programme you don’t like by calling a TV repairman “Drugs change the brain in ways that make quitting hard, even for those who want to. Fortunately, researchers … have found treatments that can help people recover from drug addiction and lead productive lives.” For this institution, fundamentally treatment so often fails, not because it has a false understanding of its target, or because it offers insufficient support, but because “Brain changes that occur over time with drug use challenge an addicted person’s self-control and interfere with their ability to resist intense urges to take drugs. This is why drug addiction is also a relapsing disease.” Just how wrong they might be has mockingly been likened to “the guy who responds to a TV program he doesn’t like by calling a TV repairman”. Another effect is to direct treatment efforts in some directions and away from others. Focus on the level of neural functioning lends itself to a corresponding focus on the chemicals – and even brain surgery and electrical implants – thought to correct faulty brains. De-emphasised along the way are influences such as broader social and environmental conditions, self-management by patients, the treatment setting, and relationships with staff (1 2 3), potentially leading to less effective treatment. More broadly in mental health, it has been argued that “overselling of drug or highly technological therapies induced by commercial propaganda has given the patient the misleading impression that a specific imbalance is the cause of his or her illness [and] leads the clinician to disregard ‘non-specific’ ingredients as optional and uninfluential” – by ‘non-specific’ the author means the common factors underlying effective therapy such as a ‘healing setting’ and therapeutic relationships. The brain-disease model does however excel on another common factor – offering a plausible explanation for the patient’s symptoms. The serially failed search for a drug to normalise the cocaine-addicted brain is perhaps the best example of the brain-disease model sending treatment down a blind alley. In 2015 things had not moved on much further than when in 2004 the World Health Organization said treatment advances realistically expected from neuroscience were simply refining existing medications, rooted in advances which long predated modern neurological understandings. One ‘problem’ brain-focused treatment solutions face is that human beings act not just on the basis of stimuli and feelings, but of their interpretation of those events – interpretations not controllable by drugs or electrical implants. Especially (but not only) in the psychosocial treatment of psychological and behavioural conditions, it is “the meaning that the client gives to the experience of therapy that is important,” not the therapy as such. A tragic example led to the death of a patient in China less than four months after he had enrolled in a trial of deep-brain electrical stimulation for heroin addiction. The electrical implant worked in the sense that drug use became less pleasurable, but in response the patient doubled his heroin intake. It worked too in that it calmed him and alleviated withdrawal symptoms, but it seems that just gave him the impression he could safely use drugs again. After undergoing implantation on the 1 March 2017, he died of a heroin overdose on the 21 June. The authors cautioned that the psychiatric comorbidity and poor socioeconomic circumstances typical of heroin addicts “poses a significant clinical challenge” for these treatments – in other words, these patients are likely to respond to what seems effective treatment in ways which render it ineffective, like the patients who negate the opiate-blocking drug naltrexone by simply not taking it. The same phenomenon affects medicine more generally where behaviour influences a treatment’s effectiveness. For example, if being prescribed a cholesterol-lowering drug leads a patient to the welcome conclusion that they can eat anything and stop exercising, the drug’s effects may be neutralised and outcomes may even be worse than without it. Rejecting the ‘brain disease’ formula doesn’t mean that medications or the effort to improve them are unimportant; painkillers calm the ache of a sprained angle, some medications ameliorate the symptoms of a cold, and some old and new intoxicants may relieve the acute pain of a failed love affair, but none of these conditions are normally thought of as brain diseases. However, devoting huge sums to high-tech solutions which could have been used to extend existing treatments seems at the very least questionable. But even in the USA, this shaping is not strong or pervasive enough to disrupt an underlying pattern in remission from dependence which belies the expectation that drugtaking progressively alters neural functioning in ways which lock the user into addiction. Outside of treatment services, ‘cold turkey’ attempts to end dependent substance use are very common and very commonly succeed. If addiction is a brain disease, given strong enough reasons/incentives, it is one its sufferers can choose not to have. Based on population-wide surveys, studies which find dependence generally remits rather than becoming ever more embedded primarily reflect the usual pattern of remission without treatment. Treatment caseloads lie at the extreme and atypical end of the remission continuum, where relapse is so common that the ‘chronic relapsing brain disease’ model partly fits the facts – not because the brain is stuck, but perhaps because so much else is stuck (1 2 3) in the patients’ lives which generates uncontrolled and continued substance use. If addiction treatment is about normalising deviation from societal norms, the brain-disease model renders this deviation physical – it can even be ‘seen’ in neuro-imaging scans of the brain. Par excellence, the brain disease model and its representations in the form of brain scans make an ‘it’ out of addiction – an undeniably ‘real thing’, not merely a failure of motivation and resolve to keep pace with what we know is good for us. Moving in the opposite direction, based on how problem drug use presents itself in practice, the latest US psychiatric classification system (the fifth edition of the Diagnostic and Statistical Manual of Mental Disorders) has abandoned any semblance of an ‘it’, rejecting ‘dependence’ as a category and preferring to define substance use disorders as ranging in an unbroken continuum from mild to severe. These disorders are not diagnosed by brain scans or biochemical tests, but by behaviour, and arguably that is all there is – a set of behaviours we term ‘addiction’ with no underlying pathology, encapsulated by one brain-disease critic as “marked by repeated use despite destructive consequences and by difficulty quitting notwithstanding the user’s resolution to do so”. The behaviours are voluntary, and so in the end is their cessation. 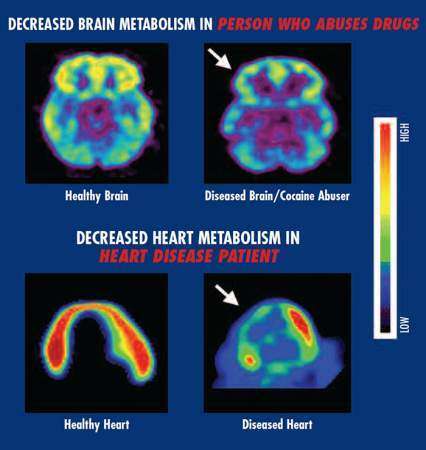 Bolstered by impressive scientific (or pseudo scientific) portrayals of a physical cause, one aim (1 2) of brain-disease model advocates was to challenge conceptions of addiction as a failure of will or morals, destigmatising addicts into the category of victims (of a disease) rather than perpetrators (of a moral failing). There seems no evidence (1 2 3) this has worked, and some that it could backfire. The study referred to above which found that depictions of this model undermine confidence that substance use can be controlled also found no compensatory diminution in the stigma and shame attached to addiction. However, along the way the disease metaphor is consistent with coercion and a policy focus on enforcement to stop potential addicts risking this disease by starting to use. But the intentions were good, and so too might be some of the effects. As with mentally ill patients, purported sufferers of this disease may seize on the brain-disease model and its representation in brain images as a kind of vindication, proving that something is wrong with them, rather than that they are morally wrong as a person. Absolution from responsibility entails however their diminution in this part of their lives into automata – a dangerous position to accept, which could justify their also being treated by others as not entirely human. Addiction treatment advocates have also seized on the model as a “useful way for particular agencies to convince Congress to raise the budgets [and] it has been very successful”. But for the eminent US addiction psychiatrist Jerome Jaffe, the cash is the fruit of a “Faustian bargain – the price that one pays is that you don’t see all the other factors that interact [in addiction]”.